At the age of 37, Lorraine Moller ran the race of her life to place third in the marathon at the Barcelona Olympics in 1992. In searing heat, she made the 4-km climb to the stadium and crossed the finish line just over a minute behind Valentina Yegorova of the Unified Team (representing 12 of the 15 former Soviet republics) and Yuko Arimori of Japan. Moller represented New Zealand from 1974 to 1996, at distances from 800-m to the marathon. 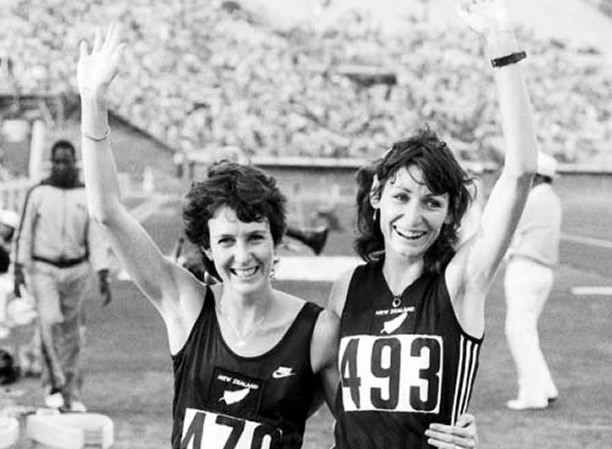 Alongside Anne Audain and Allison Roe, she led a new generation of New Zealand women runners and openly pushed for professionalism to replace the ‘shamateur’ system in which athletes were paid under the counter. The trio’s joint announcement that they would accept prize money at the 1981 Cascade Run Off in Oregon was a key moment in pushing athletics into the era of open competition. Coached by Olympic medallist John Davies, Moller built up enormous stamina by following Arthur Lydiard’s training principles. Not blessed with great natural speed, she found her niche when women’s marathoning began to be taken seriously by event promoters in the late 1970s. She won her first eight international marathons, placing second in the ninth because of illness. Lorraine Moller came fifth in the first Olympic women’s marathon at Los Angeles in 1984, and set her fastest time for the distance (2 hours 28 minutes 17 seconds) in a second-place finish at the 1986 Commonwealth Games marathon at Glasgow. These seemed likely to be the high points of her career – until Barcelona. We have 13 biographies, 3 articles, related to Lorraine Moller wins Olympic bronze.